Tag "suicide squad most wanted"
Both of the stories in Suicide Squad Most Wanted #5 are eminently readable. The El Diablo story continues from previous issues, while Amanda Waller begins a tale of her own in this issue. I love Cliff Richards' art on the El Diablo tale. The reluctant hero/villain is pitted against a variety of foes in this chapter, from Martians to Thanagarians to Aztecs, and each and every character looks great, and interesting. And, of course, El Diablo himself comes off just perfectly under Richards. Jai Nitz also brings in Justica, the Mexican grouping of superheroes that debuted so very long ago, in a Superman Planet DC annual, but who have largely sat on the backburner ever since. El Diablo has been used by pretty much everyone during the course of his solo story in this book, and the situation gets no better for him in this chapter. Deadshot does show up, but is hardly the bringer of good news. This has been an exceptionally strong solo outing, and I hope it leads to another miniseries for the character, or at least some more page time in Suicide Squad. 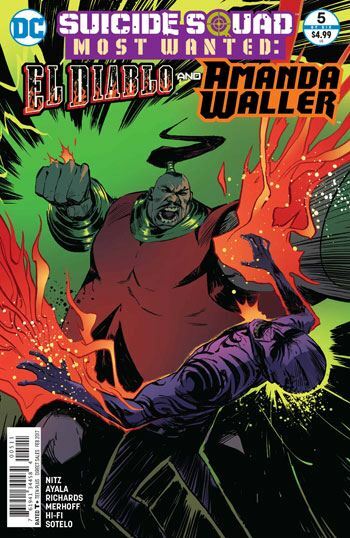 The Amanda Waller story, which begins in this issue, and will conclude in the final issue of the miniseries, deals with Waller as a deprogrammer. This is not a side of her that is often shown, although she operated this way on Blue Beetle in an old issue of Justice League. I have to admit, I am not entirely clear on what is going on in this story. Particularly in the last few pages. The rest of the team are out on a mission, which seems to be occurring simultaneously with the deprogramming that Amanda is doing, although the same man seems to be involved in both plot threads. And I just have no clue what is happening at the climax of the tale. Still, the art is good, and the writing engaged me enough that I am willing to overlook the confusing elements until I read the resolution.